The potato is a versatile vegetable. Bake it, fry it, sauté it, grill it, or roast it. Add herbs and spices, cheese or just salt and pepper and a potato is delicious. 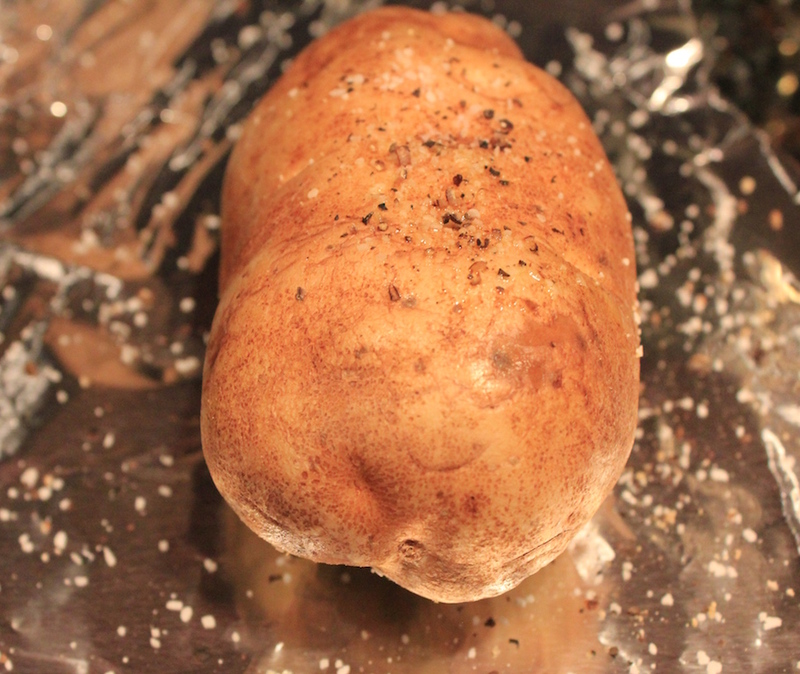 Here’s a little primer on potatoes and my recipe for a Baked Potato. Potatoes grow in a variety of shapes, sizes and colors and the flesh ranges from starchy to waxy. They can be cooked using both moist and dry heat, though some types are more suitable to one than the other. 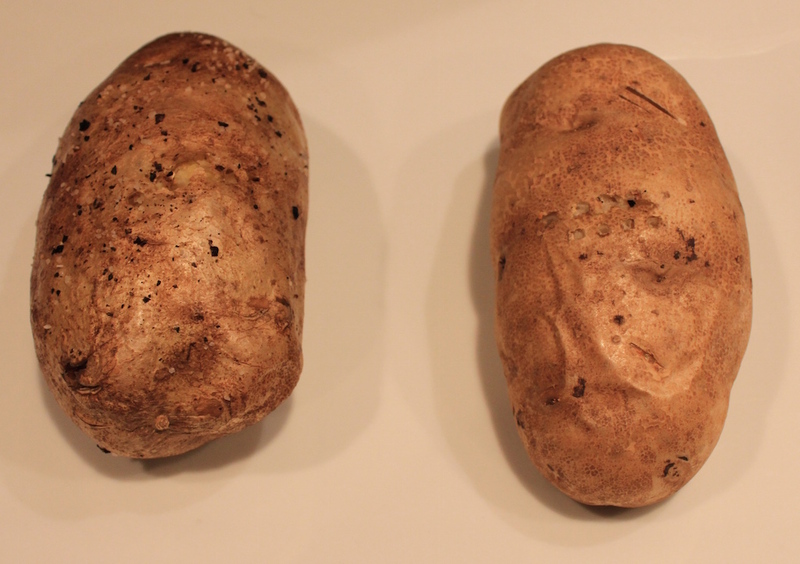 Select potatoes that are firm, smooth, with no or few eyes, good color, and no blemishes. Look for similarly sized and proportioned potatoes for even baking and round or oval shape for easier peeling. Russet or Idaho Potatoes: These potatoes have a thick, brown skin and white flesh. The high-starch cells absorb more water than medium- and low-starch potatoes and separate during cooking into a crumbly or mealy texture, perfect for baked or mashed potatoes and crispy French fries. Because of this mealy texture, Russets don’t hold up well in salads. Waxy Potato or All-Purpose White Potato: This is the potato you see in every grocery store year round. It has a slightly lower starch content than the Russet, is good baked whole, cut into slices in a casserole or gratin or cut into steak fries or smaller chunks and roasted. Yukon Gold; These potatoes have a golden-hued flesh, creamy texture and a natural buttery flavor, also good for baking or mashing. There are many varieties of low-starch potatoes. They absorb less water, stay firm and have a waxier texture. They can be steamed, boiled, roasted or grilled, and are ideal for recipes where the shape of the potato is essential, such as salads. 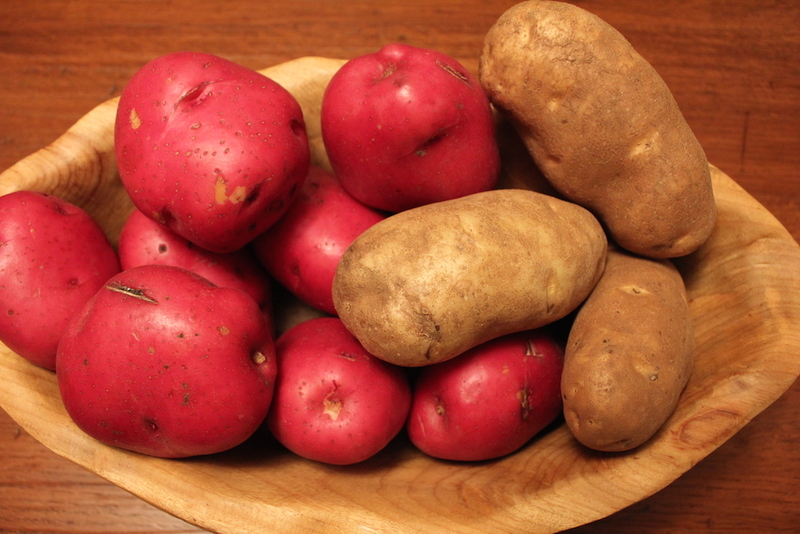 Varieties include: red potatoes, fingerling potatoes, which resemble a plump finger with a yellow flesh and butter flavor, long white potatoes with a thick, light tan skin and firm creamy texture; or blue and purple potatoes. The latter can have a flesh color that ranges from lavender to purple, however, the color leaches out into cooking water and the cooked potatoes are not as vibrant. New Potatoes: Anything referred to as a new potato is freshly dug, sent directly to market, and has a thin skin and waxy texture. Creamers: Small baby potatoes, either white or red skinned, harvested prematurely at about one-inch in diameter. Store potatoes in a dark, dry, cool place for up to two weeks to prevent sprouting and excessive moisture loss. Potatoes are members of the nightshade family (tomatoes, bell peppers and chili peppers), and exposure to light may cause green spots to appear on the potato, an indication of the alkaloid solanine, which has a bitter taste and can be toxic in large quantities. No need to toss the entire potato, just cut away any green portions before cooking. Peeled potatoes oxidize, or turn brown, when exposed to the air; simply keep them submerged in cold water to keep them white. Hard water, which has a high alkali content, may cause potatoes to turn pink or yellow; to counteract, add an acid, such as lemon juice or vinegar to neutralize. The recommended amount is about 1/2 teaspoon of the acid to a gallon of water. Always scrub potatoes with a vegetable brush to remove dirt. Cut away any eyes or a crevice the brush can’t reach. Potatoes can be cooked with the skin or peeled. There are many nutrients in the skin and they’re delicious. I always eat the skin on my baked potato. Mash red potatoes with skin on. Serve potato salad with skins on. Potatoes also hold their shape better when cooked with skins on; if you want skinless potato salad, peel them after cooking. One of the simplest ways to cook a potato is to bake it or microwave it. After washing, dry thoroughly and pierce three times with a paring knife along the top to allow steam to escape during cooking. The potato makes it’s own chimney while cooking, which may lead to messy pieces of burst potato on your appliance walls, so don’t forget to pierce it! Potatoes can be baked in the oven or cooked in the microwave. The microwave version has a soft skin. For a crisper skin, baking in the oven is optimal. Rubbing a little olive oil, salt and freshly ground pepper over the potato before cooking is a way to infuse more flavor into the potato and get a crispier skin. Or, just toss the cleaned, dried and pierced potato in the oven with nothing else. There are many delicious toppings: melted butter, yogurt, sour cream, chives, shredded cheese or a combination of a few of these ingredients. Don’t hesitate to top your baked potato with beef or chicken taco mixture or beef stew. Let your imagination run wild! Wash, dry and pierce the potato three times along the top. Aluminum foil for oil rubbed potatoes. 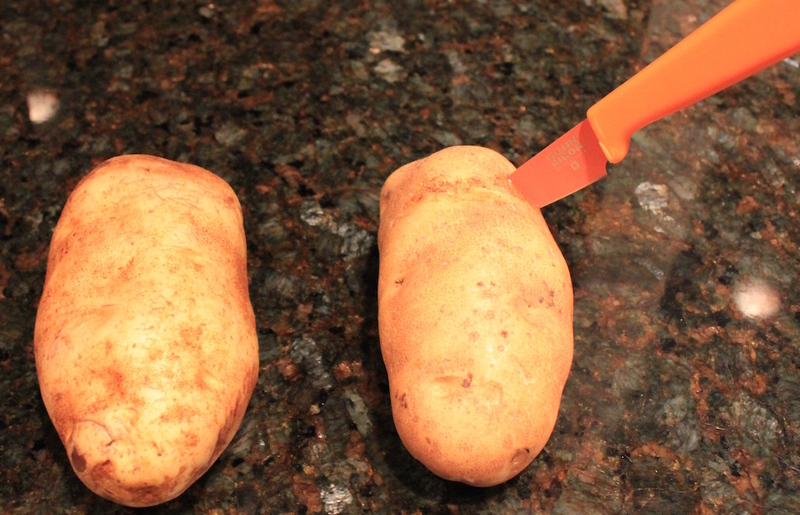 Method:Bake until a fork easily pierces the potato, approximately 60 minutes for a medium potato. Note: To microwave, follow the above procedure, and cook until a fork easily pierces the potato. The timing will depend on the power intensity of your microwave, anywhere from 3 to 5 minutes. To serve: Slit the potato lengthwise and horizontally down the center. 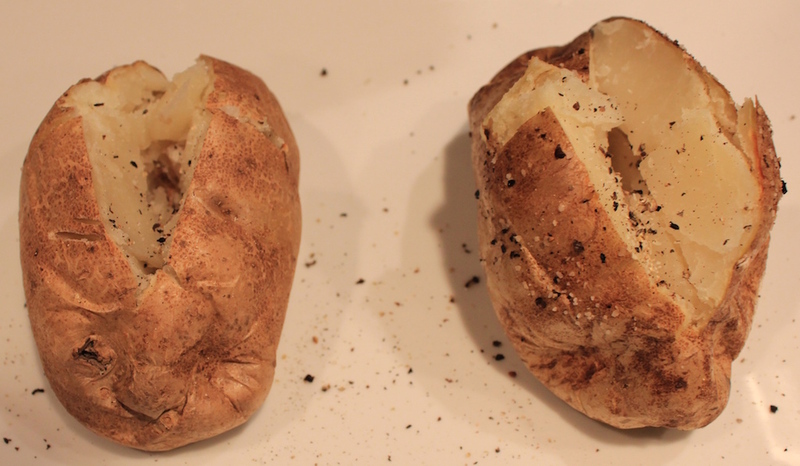 Push the ends with your hands to crack the potato open and create a hole to fill with the topping of your choice. Potatoes can be baked in the oven or cooked in the microwave. The microwave version has a soft skin. For a crisper skin, baking in the oven is optimal. Rubbing on a little olive oil, salt and freshly ground pepper (lots of pepper for me) before cooking is a way to infuse more flavor into the potato during cooking and get a crispier skin. Or, just toss the cleaned, dried and pierced potato in the oven with nothing else. Bake until a fork easily pierces the potato, approximately 60 minutes for a medium potato. Note: To microwave, follow the above procedure, and cook until a fork easily pierces the potato. The timing will depend on the power intensity of your microwave. Thanks. My last microwaved russet was kind of mealy. Will try a medium Yukon Gold.